Sue Sierralupe has been a freelance writer for more than 15 years. She teaches classes in sustainability, herbal medicine and native plants all over Oregon. Sierralupe is a certified medical herbalist, master gardener and sustainable landscaper. She writes about these subjects on her website at Thepracticalherbalist.com. Calendula oil is a common herbal oil remedy for treating skin conditions. No first aid kit should be with out this helpful medicine. Although calendula is available in a variety of topical forms, oil is the easiest to use and make. It is best when processed with cold pressed oils like almond or olive oil. Vitamin E is also often added to calendula oil to serve as a preservative and skin conditioner. Swollen, inflamed tissue is the ideal place to apply the healing properties of calendula oil. Dry skin, eczema and hemorrhoids respond to calendula's high triterpenoid content. Reducing inflammation is also key to reducing pain. Parents can rely on calendula oil to ease the pain and irritation of diaper rash. Use calendula oil to fight bacterial infections in skin abrasions. Nutritional consultant Phyllis A. Bach, states in her book "Prescription for Herbal Healing" that external treatment with this herb will "kill Staphylococcus aureus, a common germ that infects abrasions, burns, and cuts." This translates into extra healing power for skin that gets battered by abrasive work such as landscaping and woodworking. 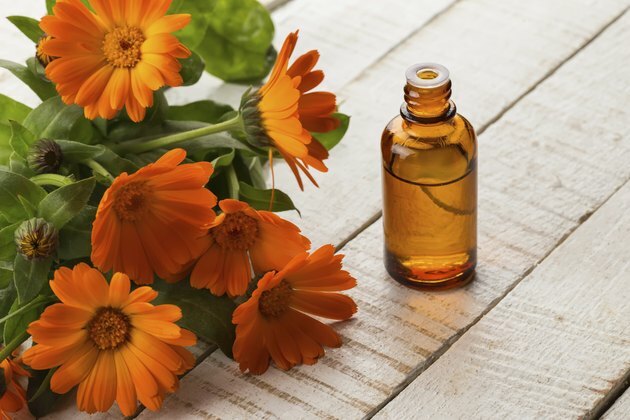 The antiseptic properties of calendula make this oil a top choice for every first aid kit. Use this herb to prevent infection from bug bites, scratches and minor cuts and burns. Oil should not be used on deep tissue burns and cuts. Discontinue use if allergic reactions to calendula are noticed. Can Vitamin E Oil Help Sunburns?